Pandora Radio is easily one of the best ways to stream music to your iPad. The key to Pandora Radio is its ability to create custom radio stations that fit your particular tastes in music, even learning songs you like and dislike. Best of all, it is free with advertising, so you don't need to pay anything to enjoy Pandora. While you can stream Pandora through your web browser on your PC, you'll need the official app to stream it on your iPad. You can download it by clicking the link above or by going to www.pandora.com and clicking the download button. You will also need to create an account to get started. Your account is important because it will keep track of your custom radio stations. While Pandora has a number of radio stations based on genres ranging from rock to blues to indie to jazz, custom radio stations are the best way to tune Pandora into the music you like best. You can create your own radio station by typing an artist, band or song name into the " Create Station" text box in the top left corner of the app. 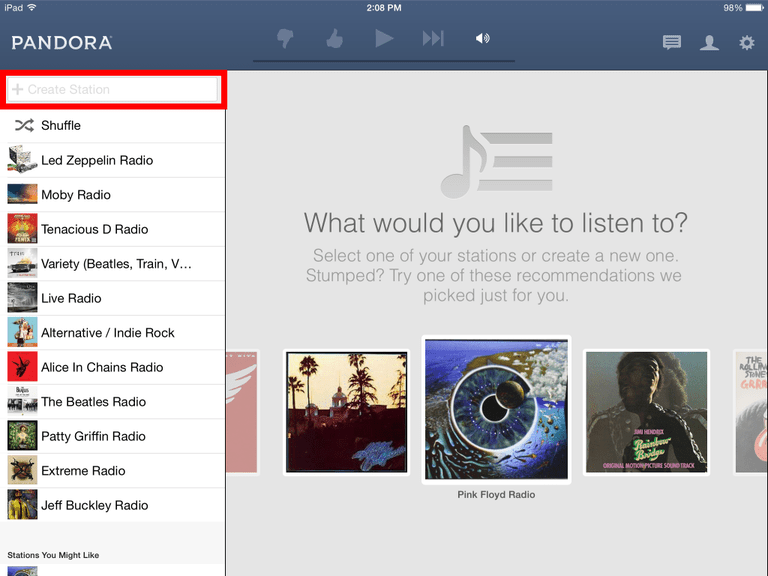 As you type, Pandora will pull up the top hits, which includes artists and songs. When you see your target, simply tap it to create your custom station. When you create your radio station, Pandora will begin streaming music similar to that artist or song. It usually starts out with the same artist, though not always the same song. As it streams music, it will branch out to music from similar artists. As you listen to your new station, you will inevitably hear songs that don't exactly ring your bell. You can skip songs by tapping the skip button, which looks like the next track button in your music controls. However, if you really don't like the song, it is better to tap the Thumbs Down button. While the skip button might be interpreted as you not being in the mood to hear that particular song at that specific song, the thumbs down button tells Pandora that you don't ever want to hear that song. Similarly, the Thumbs Up button tells Pandora that you really like that particular song. This will help Pandora learn your musical tastes, allowing it to play that song and similar songs more often in the stream or in similar custom radio stations you've created. This is really the key to enjoying Pandora Radio. When you add additional artists or a new song to the station, it will increase the overall variety of the station. For example, streaming a custom radio station based on The Beatles will feature a lot of music from the 60s such as Bob Dylan and The Rolling Stones, but if you add in Van Halen, Alice In Chains and Train, you'll get a wide variety ranging from the 60s and 70s all the way up to current music. On the left side of the screen is a list of your radio stations. You can add a new artist or song to your station by tapping the three dots to the right of your custom radio station in the list. This will produce a menu that includes the ability to see the station details, rename the station, delete it or share it with friends. Tap the "Add Variety" option to add a song or artist to the station. You can also get to the station details by swiping from right-to-left on the screen. This will reveal a new window on right side of the screen that shows the station seeds. You can add a new song or artists here by tapping the "add variety..." button. You can leave this screen by swiping left-to-right or by tapping the X button in the top-right area of the station details. Listening to music is about feeding your mood, and it is doubtful that a single station will be enough to fit every mood. You can create more than one station, either by using multiple seeds such as combining favorite artists or mixing songs from different genres, or you can simply type in a single artist to pinpoint a particular type of music. Pandora also has a number of prefab stations. The bottom of the list on the right has "More Recommendations", which will take you to a list of recommendations based on your custom radio stations. At the bottom of this list, you can "Browse All Genre Stations". You can then search through the lists for something that appeals to you.